Dubai, UAE, March 25, 2019: The best in healthcare information and technology in both the UAE and the world were celebrated and discussed extensively at the 4th HIMSS Middle East UAE eHealth Week 2019 Conference and Exhibition. 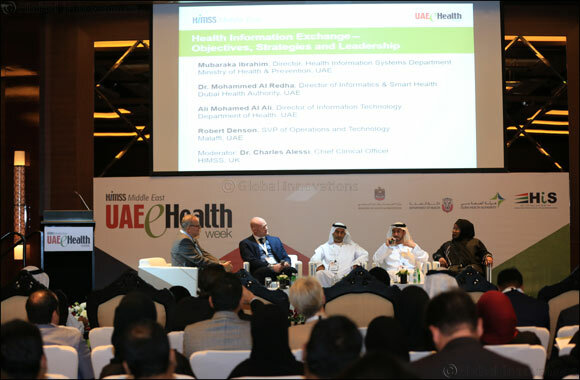 The 2019 edition of e-Health Week is the ninth event hosted by HIMSS in Dubai and was held under the patronage of the Ministry of Health and Prevention (MOHAP), the Department of Health, the Dubai Health Authority (DHA) and the Emirates Health Informatics Society and supported by the Abu Dhabi Health Services Company (SEHA). Dr. Mohammed Al Redha, Director of the Executive O¬ffice For Organizational Transformation, Dubai Health Authority (DHA), said, “If we are going to continue leading in the age of digital transformation, we have to understand the landscape and keep ahead of trends. As patients are shaping the market, we as regulators always need to be two steps ahead and develop a comprehensive collaborative schedule that gives us foresight”. The healthcare market in the UAE is expected to grow by over 8.5% between 2018 to 2023, so demand for new facilities and technologies is higher than ever before ; local authorities recognize and address the need for providing healthcare that is in line with the region’s Vision 2030 and its pursuit of healthcare excellence through technology and national eHealth projects.